In August, Julie from Swatch and Review was my featured blogger. You can read that post and see other past featured blogs under the "blog of the month" label! Being my blog of the month gets you a designated blog post, a sidebar button, and a mention on my Twitter account. The sidebar button stays up all month long. I don't believe in necessarily making bloggers pay for advertising and I'd much rather show you blogs that I really enjoy reading. And I hope you end up enjoying them too! 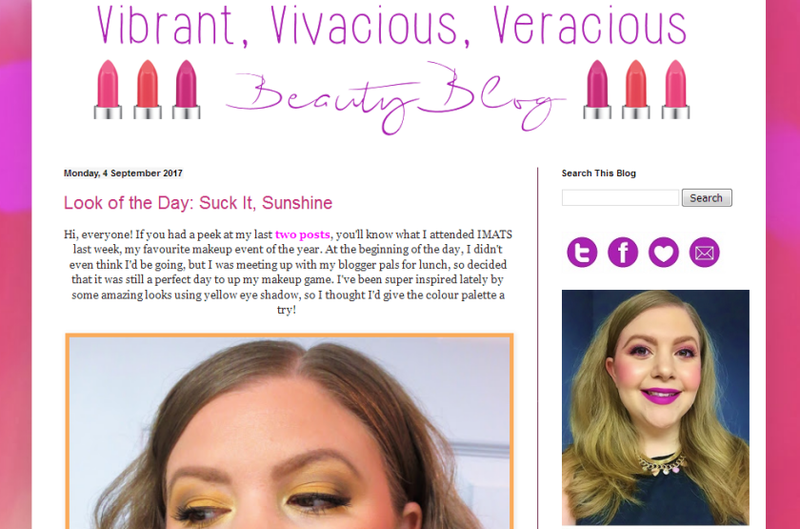 Jen from Vibrant, Vivacious, and Veracious Beauty is the featured blogger this month. If you're not familiar with Jen yet, she focuses on beauty and she excels at colorful looks. As a self-proclaimed neutrals girl when it comes to eyeshadow, I find myself living vicariously through some of her amazing looks. In a recent post, she used yellow. I can't remember the last time I used yellow in any look. If you're looking for some great inspiration and swatches, check out Jen and let her know I sent you!